After the huge success of this years Beta weekend in Norfolk, We are starting to plan for next year's event. Giving Amanda a well deserved rest after the last two years of very hard work. James will be posting more info soon. What I can tell you now is that this is sure to be a very memorable and special event for al the right reasons!!! I am pleased to announce that booking for BetaMeeta'13 is now open! For all packages that include accommodation, please book directly with The Sharnbrook Hotel on 01234 783142, stating clearly that you are from the Lancia Beta Forum. You will need to have your menu choices ready, and payment must be made in full when you book. Sounds like a quality event at a great venue, sadly will still be Beta-less this year and will need to direct all spare funds to the VX as I am under threat from Julia that the car must be finished by the time of her wedding. So I can't make it but hopefully there'll be Betameeta 2014 and you will see me there! As last year,We are interested in joining the BetaMeeta13 event. Do you still accept offshore LHD Betas? We know that the number of rooms is very limited and we don't want to take the place of a genuine UK Beta driver. However the memory of the 2012 event is such that we would like to cross the channel again (the beginning of a tradition). You are a legend Claude ! Just wanted to inform you that events for Saturday have now been planned, and full details will be revealed soon. I'm pretty sure everyone will enjoy it- might even get competitive!! Please remember to make any bookings that include accomodation directly with the hotel on 01234 783142, and any day package bookings through me. Just to let you know that Anne and I have booked the two day package for this years event. Looking forward to it as I am sure you all are. Just out of interest how are the bookings going, as "traffic" on this subject has appeared a bit quite since it's announcement? On the subject of which car we are bringing this year it looks like "Lulu" will not be ready, as I have been working on another big car related project instead, namely a proper garage facility for our cars and stuff! We have recently bought an old piggery nearby and plan to revamp it into a garage/ workshop (bolthole). The internal dimensions are 42ft long by 23ft wide and set in 0.2 of an acre. So plenty of potential I hope! So If it's ok with you guys we will be coming up in our 1983 Pininfarina Spyder. Lets hope the weather is good. If you haven't booked yet make sure you have before Friday 26th April. I'm going to send a email to all forum members reminding everyone of the deadline. It's not quite a garage from heaven yet. It needs a new roof, entrance way concreted, complete fitting out inside, decking to rear and security added. It is a great project which I hope will take a year or so. I will post a couple of pics soon. When finished we could have a small meet here maybe? It is just 4 miles from Marks premises, so will be convenient for the Betaboyz! (Oh I will be installing a kitchen area complete with man fridge etc). I reckon that the turning area outside will accomodate six guests, as long as they are Italian of course! Thank you very much James for organising this years event. We are booked for the whole weekend package and really looking forward to it! We are hoping to bring our Spyder along this year after she was taken off the road in November for a complete overhaul. We have cleaned and repaired a VX interior to go in and we are currently having integrale wheels refurbished and re-sprayed in Exeter and a new hood made. She is going to be sprayed White instead of the flat grey micro-blistered condition we bought her in. Chas: We will be up in the next few days to have a look at this piggery and reserve the best parking places! Looking forward to meeting everyone again and hopefully a few of you will be at Bristol! After this week, you can still book any of the hotel packages subject to availability- but the remainder of the rooms will go back on general release, so there is no guarantee you will get a room. Unfortunately myself and Mrs Novat will not be able to attend this year, having just relocated we have a huge amount of work to do here. Once we have broken the back of the work and we have mire spare time available I'm sure we will be attending a few events in the UK again. I hope it all goes well and I look forward to hearing about it and seeing some photos. all booked for Friday and Saturday. Looking forward to seeing everyone who can make it there. If you can arrange the weather to be as good as last year that would be good.........No pressure! Don't be too down hearted by the lowish numbers attending the hotel part of the event. 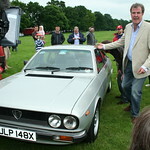 This has been an incredibly busy spring in Lancia circles. The LMC has had Great Northern Weekend (GNW), Welsh Weekend and Fulvia 50 in the space of less than nine weeks. Perhaps it's not surprising that they are struggling to fill rooms at their National Weekend in four weeks time. Personally my events budget only runs to two hotel weekends a year. I went to GNW as it is the closest to me and I like to support the limited number of Lancia events in the North of England (it was pretty much snowed off, so the hotel bit of it ended up being pretty important!). As an LMC committee member I'm pretty much obliged to go to the National Weekend, though I'd probably have gone to Fulvia 50 if it wasn't so far away. As an indication of how crowded the calendar is, some LMC Committee members even suggested skipping the National Weekend all together! Hopefully the National Weekend and BetaMeeta will attract a lot of day trippers. I hope to make this event...well from Saturday. Just got the Coupe back from the paint shop and everything is going well on the rebuild...fingers crossed for the re-instatement of the windscreens. The wife will phone the hotel on Monday.